If you think that eating Dals and Eggs is enough for protein, then you need to think twice because chickpeas would also be a good alternative of protein. 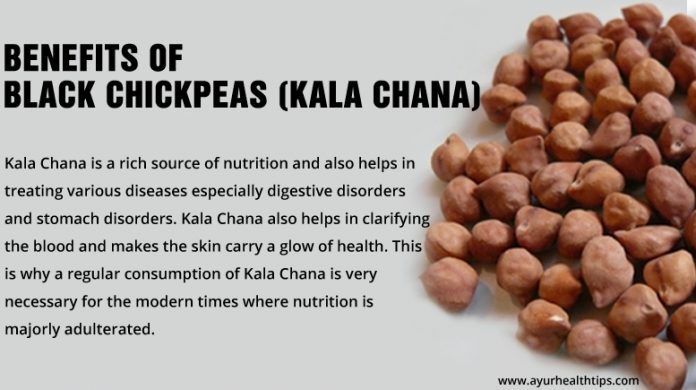 There are so many health benefits of black chickpeas (Kala Chana) you can enjoy by adding it in your dish. Mainly black chickpeas are good for all stomach disorders and digestive problems. This is the main reason why the water collected from boiling black peas is highly nutritious for children suffering from Colic pains. 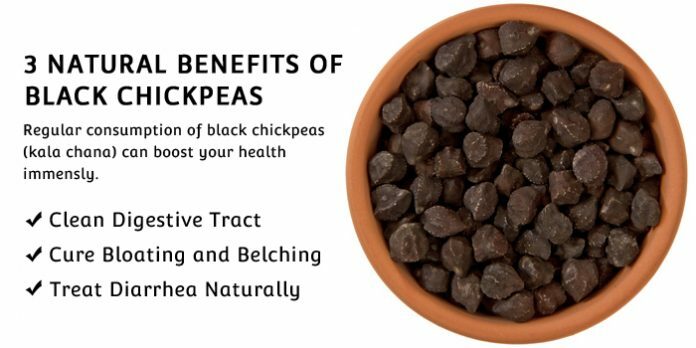 Benefits of Black Chickpeas are immense and can help you to stay healthier naturally. Chick pea Seeds are very nutritious and apart from providing the essential elements it also helps in clearing the digestive tract. It also relieves complains of bloating and belching if consumed regularly and contains enough roughage to smoothen the excretory cycle of the body. In case of a stomach infection, eating Kala Chana is an effective in retaining the nutrition of the body and stopping loose motions and getting rid of diarrhea! The other family members of this protein and roughage rich family are White Chana, Kabuli Chana and Legumes like Rajma and Choley. Among all the other types, the Black chickpeas (Kala Chana) are the most easily digested. How Black Chickpeas are Good for the Skin? Why Do You need to Add Black Chickpeas in your Diet? Chickpeas are low in fat, high in dietary fiber and rich in healthy vitamins and minerals. 2 or 3 tbs can provide the same nutritional value as 5 portions of fruits and veggies. Thus, you should add these legumes to your diet to avail all the benefits that black chickpeas offer. Black chickpeas (Kala Chana) are very hard in its structure and needs to be pressure steamed before being cooked. Alternatively, you may also soak the required quantity in water overnight to soften them a bit. But what do you do if you have to cook them immediately at a short notice? Just add half a teaspoon of baking soda to it and see it soften in a matter of minutes in pressure steam! Hope you guys find multiple reasons why you should add black chickpeas in your diet and what benefits you can gain from this nutritious grain. Don’t forget to share such incredible benefits of black chickpeas with others on social media.